More bitterns have been recorded than at any time since the early 19th Century, says the RSPB. Bitterns are counted by listening for the far-carrying, booming call of the male bird. So far this year more than 150 have been recorded in England and Wales. Last year, 140 booming males were counted at 61 sites. According to the RSPB, it has already been an exceptional year for the bittern, offering hope that conservation efforts to restore lost habitats can help other species. "We've probably got more bitterns than we've had for the last 200 years," said Grahame Madge of the RSPB. And Martin Harper, the charity's conservation director, added: "The bittern is a species which proves that conservation can be successful, especially when you can identify the reason behind its decline and bring in measures and funding to aid its recovery." The bird - a type of heron - relies on reed beds in marshes and wetlands for its hunting and breeding grounds. 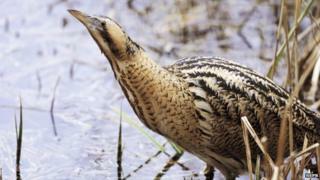 The RSPB says projects to restore wetlands have given the bittern a chance to recover from its extinction in the 19th Century, and another fall to very low numbers in 1997, when only 11 males were recorded in England. According to this year's figures, Somerset has the most bitterns, with more than 40 males. More than 80 have been recorded in East Anglia, including at Lakenheath in Suffolk and Ouse Fen in Cambridgeshire. One bird has also been heard for the first time at Anglesey in Wales.